When it opened in 1988, Seogwipo Submarine was the first company providing submarine tours to the general public in Asia - and only the third in the world. Today it continues to offer exclusive 70-minute rides to an underwater kingdom of corals 40 meters under, 18-20 times a day. In 2013 it celebrated its 25th anniversary and the captains, Kim Wonjang and Kim Kwanghyun, were certified by the Guinness Book of World Records in 2007 as being the longest serving submarine captains in the world. At the time of my visit they had served for 25 years, 6 months, and 7 days. 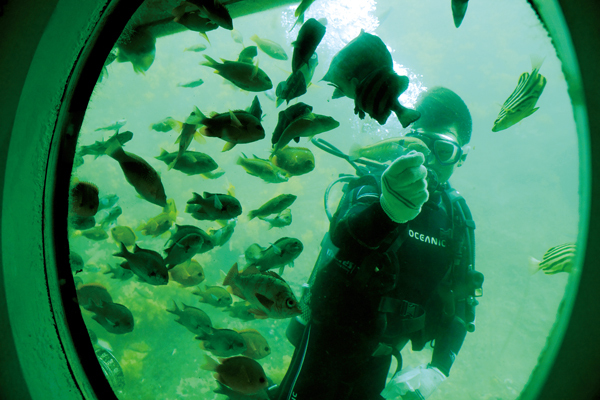 For an actual scuba experience visitors will need to find one of the many dive shops in Seogwipo, which require a day of lessons and a fair amount of money. 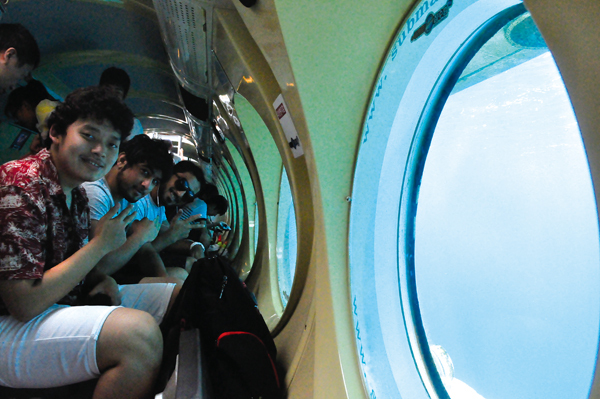 This makes Seogwipo Submarine a great way to view the underwater kingdom safely with friends and family. Reservations should be made in advance as tickets quickly sell out, but if you do arrive without booking, you can use the hour or two wait to enjoy Cheonjiyeon Waterfall or even Bird Island, accessed along the beautiful Saeyeongyo Bridge and only a stone’s throw from the submarine ticket office. The ride starts with a ferry to nearby Munseom Island, infamous for its many bugs! The island has a pristine marine ecosystem and its soft coral reef is not only beautiful, but the world’s largest, regarded by many as a scuba-diver’s paradise. You are taken to a floating sea platform to board the submarine, a 2003 Finland-made vessel named Jiah. It is currently the world’s largest tour submarine, with 26 porthole windows for the 67 passengers it can hold. 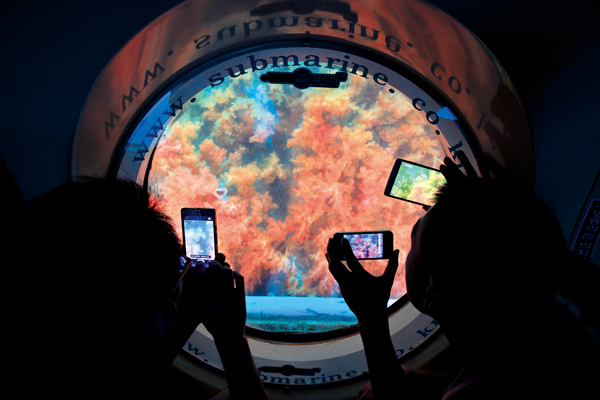 To allow passengers to take in the views from two score meters under, the submarine stops four times on the trip. Three of these are best seen from the right, while the last is best seen from the left. At the first stop a local scuba diver attracts the fish to the submarine by dispersing feed. One of the most common fish you will see around Jeju is the damsel fish, or “jaridom” in Korean, famed in the “hoetjip,” or raw fish restaurants around the island. 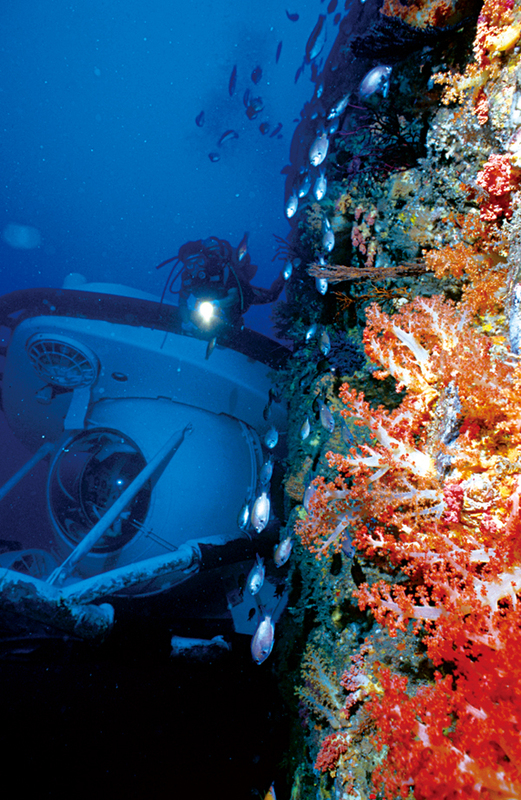 At the next stop we visit a 40-meter-deep shipwreck. Unfortunately, there are no amazing ghost stories about the ship - it was just dumped to save the cost of disposal and now serves as a tourist attraction. Finally, the submarine stops next to a beautiful red soft coral reef wall. 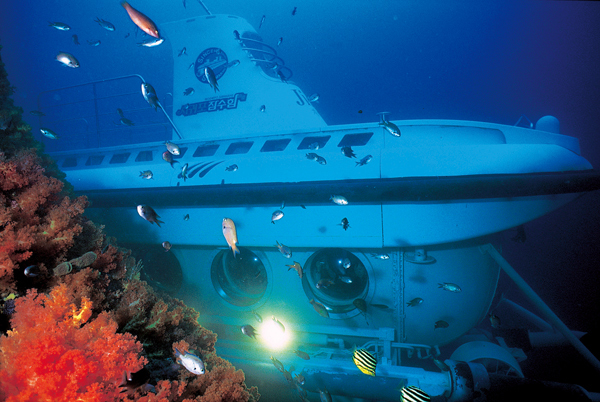 Suddenly, the blue underwater light, previously covering passengers’ faces, turns red due to the yellowish red light as reflected by the coral. It is interesting to note that the corals are living animals which grow by only a centimeter every decade. Although personal cameras are allowed, a photo service is provided and every passenger is given a souvenir photo of themselves after the trip. You can also purchase additional photos for 7,000 won or make them into a customized souvenir such as a keychain or fridge magnet. First ride: 7:20 a.m. / Last ride: 6:40 p.m. Adults: 55,000 won; Youths (middle and high school students): 44,000 won; Children (3 years to elementary school age): 33,000 won.